This view of the Pantlind Hotel looks to the southwest from the corner of Monroe and Lyon; that corner of the building was occupied by Kent State Bank, the left corner of the hotel at Monroe and Pearl housed the Old National Bank, and those two banks merged to form the Old Kent Bank, eventually purchased by 5th/3rd Bank. The arched entrance flanked by pillars at the main entrance on Monroe reflects the Beaux Art style of architecture, as do the tall arched windows at street level. The actual foot print of the original building is a reflection of both the Italian Renaissance and the Beaux Arts, with its blocky shape, broken by the set-back in the middle of the front side, and its use of a platform of two stories upon which the rest of the building sits, and topped off by a wedding cake swirl of ornament. 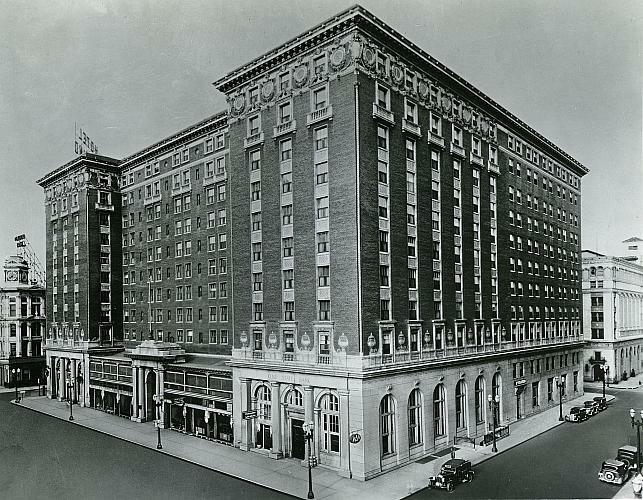 In 1923 a 189 room addition, visible in the photo, was added to the hotel on the Lyon Street side. The building behind the hotel at the far right is the Fine Arts Building at the corner of Lyon and Campau, which was added to the Pantlind at the time of the Amway Grand Plaza reworking. The building at the far left was the Clock-Tower Building, so called because of the large clock in the tower at the top. Title from collection. The Pantlind reopened in 1981 as the Amway Grand Plaza Hotel with a totally refurbished building and a twenty-nine story addition on the west side of the hotel, along the Grand River. The Beaux Arts was a highly eclectic style, very popular in parts of Europe, and for some purposes, in the US at the time of the construction of the Pantlind Hotel, and for perhaps thirty years before. It was particularly popular with both builders and patrons for hotels (Waldorf-Astoria), as an indication of cultural sophistication and excessive opulence. The style expressed parts of several other, more pure styles, including the Italian Renaissance, Classical Revival, and the Baroque. One might view the Beaux Arts as a re-working of the purer Italian Renaissance (of which the St. Cecilia building is a great local example) into a sometimes dizzying display of opulence. Hotel guests viewing the outside of the building would expect to encounter yards of red velvet and gold tassels, with acres of gold leaf just inside, which is exactly what was there, originally.